We market ourselves as an "eCard Company" because that's a term people understand. Yes, we have the traditional Birthday Cards, Season's Greetings and Thank You Cards. We're advertising free, reasonably priced and customizable – which is perfect for most businesses. But for the average 'eCard sender' that just wants to send a company holiday greeting card or an occasional birthday card, their needs might be better met going to one of our lower cost (or free) competitors. "That's crazy! ", you might say. "No one should turn away business!" And you might be right...but here's the thing: CorpNote is so much more than a website for sending an occasional online greeting card. We're much more than a one-trick eCard pony... Someone looking for a fast fix to mend a forgotten birthday will never appreciate our automated recurring eCards - a feature that helps you to not forget to send a greeting card for next year's birthday. A corporate intern hired just to blast out a thousand "Happy New Year" wishes at the 23rd hour will never experience the grace of our online contact manager that groups your contacts and seamlessly handles subscribe/unsubscribe requests throughout the year. When you join us, you are getting a business partner that truly cares about your success, respects your deadlines and budgets and goes the extra mile to help you look great. Truth be told, people don't realize how much they need us until they find us. Once they do, and they begin to understand how all our tools work and how they work together, they realize how CorpNote can be adapted to enhance the way they communicate. It becomes a lifestyle... day to day and month to month! CorpNote is an ALL-YEAR lifestyle. It's a way to author visually-rich communications for any occasion. It lets people without art skills quickly create and share professional messages that look great in email, on cell phones and in social media. And because it's customizable, it's a way for people with design skills to shine. CorpNote is a collection of tools bundled together into a web-based service that you can access from anywhere, at any time. It's a way to recognize your clients' and employees' birthdays, anniversaries and other celebratory moments, without ever having to buy and mail a card. It's a tool that lets you spontaneously send off a quick thank-you or sales follow-up message. It has features that are ready to go to work for you at a moments notice, and other features that can be scheduled in advance… so you can enjoy quiet time, too. "People don't realize how much they need us until they find us..."
CorpNote is a COMMUNICATIONS lifestyle. We believe that every business correspondence can be the beginning of a long-lasting conversation. That means a two-way exchange. Long gone are the days when you could paste a poster on a wall and expect customers. When you send a business message, people have to be able to reply. And you've got to be able to quickly and easily follow up. Everything you send with CorpNote — our eCards, our online invitations and our online surveys – has the ability for your recipients to reply. We give you space to share your full contact info, and to link to your social media, your website and more. And everything you send from CorpNote uses your own email address, so when someone clicks 'reply' it's going straight to you. When using CorpNote, you'll never hear someone say, "I didn't know how to reach you." CorpNote is a BUSINESS lifestyle. If you are supporting or promoting a company, an organization, a concept, or just selling yourself – branding is an essential part of your communications. That's why we've gone to great lengths to let you build your branding into CorpNote. Logos, contact info, colors and even your own graphics can all be saved into your CorpNote account so, when you send a message, it's always colorful, professional and memorable. How you look is only important if you are being seen... To that end, we've built our tools to let you share your message not just through email, but on social, via text messages and on your website and other electronic media where you want to spotlight your message. And being heard is only possible if you have something to say. That's where CorpNote shines! We make it easy to find reasons to keep in touch with your contacts. CorpNote lets you spontaneously create casual message like 'thank you' and 'special announcements' with a moment's notice. We give you powerful imagery and tools for sending recurring eCards for employee recognition and customer appreciation, time-saving tools for planning events with online registration, and an easy way to create meaningful surveys and forms that let you communicate better, whatever your needs and however small (or big) you might be. 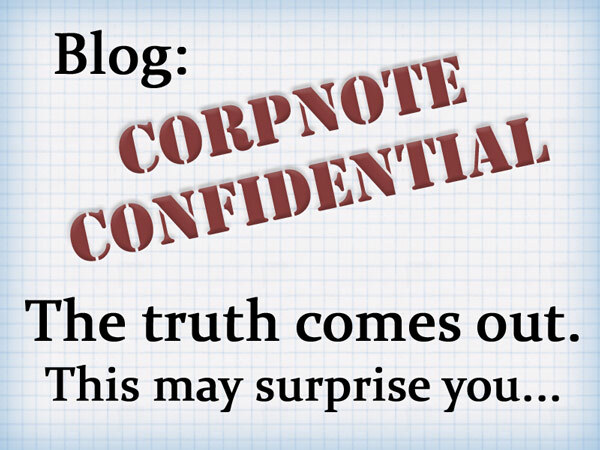 CorpNote is a PERSONAL lifestyle. We're more than a website or a software company. When you join us, you are getting a business partner that truly cares about your success, respects your deadlines and budgets and goes the extra mile to help you look great. We take pride in our product, our card designs and our ability to adapt to our members' individual needs. We're innovative and accessible, so when the time comes that you're in a creative rut or you need to solve a unique challenge, you have a valuable ally with proven experience and a long history of industry-leading customer support! The more you know us, and the more you let us know you, the better we can work together! Just so there's no confusion… When you want to send a year-end holiday eCard, or do an online invitation for an event, do I want your business? Of course, I do! But after your eCards are sent, and before you click that 'cancel membership' button, if there's anything you've just read that just may be of interest, then please accept my invitation to contact me. We really do love getting to know you, and all of our customers. That's why we're so much more than "just another eCard company." The more you know us, and the more you let us know you, the better we can work together!